One of the best daily emails in my inbox is The Listserve – every day one random person is chosen to win the “Listserve lottery.” The subject of the posts vary and I always find myself entertained, inspired, or learning new information. 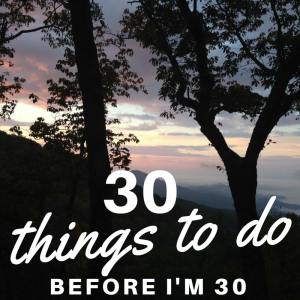 One of my favorite posts was December 23, 2014: 30 things to do before I’m 30. The writer, Rachel from London, inspired me to make my own list!